Have you seen the beautiful artwork of our Peace In Christ Young Women's set? One of the awesome components of this kit is the Succulent Cutting File. 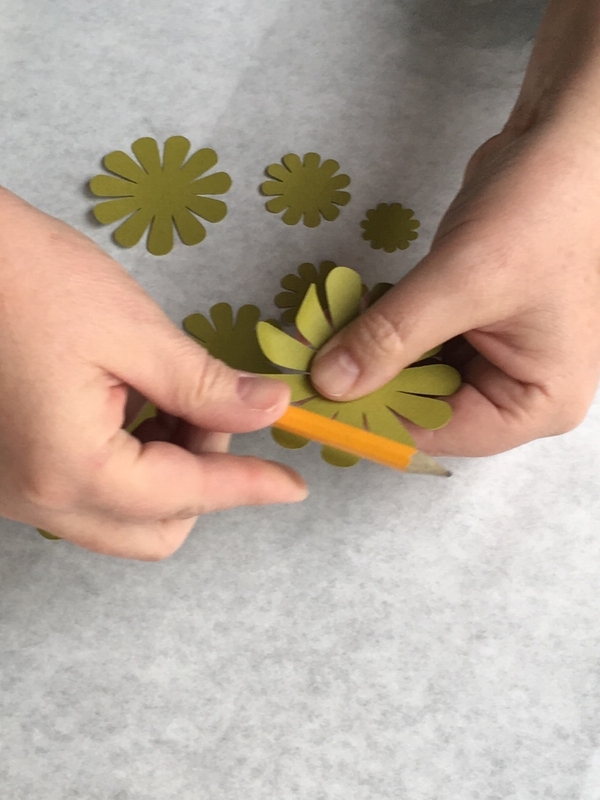 Deena used the file to make paper succulents to adorn the bulletin board in her own Young Women's room. The best type of felt for this project is wool felt, not your craft store felt. You can find it at your local quilt shop, or if you do not have a good source locally, there are lots of options online. You won't need a lot - one fat eighth (as shown) will make 5-7 succulents each. But it is important to get several shades of green/gray/blue for the most life like look. Download the Succulent Cutting File onto your cutting machine. Load your cutting mat with a 12 x 12 piece of freezer paper. I used the cutting files just as they are, but you can resize them if you like. I used the preset for "copy paper" and pressed send and let my Silhouette do all the hard work! After the cutting is finished, weed all the succulent pieces and sort them by type. Take all the needed pieces for one succulent and iron onto the freezer paper (shiny side down) to the wool felt (it takes only a second on medium heat to get the freezer paper to stick). I found this method so much faster than trying to trace each of the small pieces onto felt, and as a bonus, there won't be any traces of ink on the finished product. If you were doing this as a group craft activity, you could have all the felt prepped with the pattern pieces and the girls could start cutting immediately. Cutting all the felt pieces is a little tedious - it is possible to cut the felt pieces on your cutting machine. There are a lot of tutorials on the web, however, due to it's thickness it can be tricky and takes some extra prep...all things that I did not want to bother with for such a small project. If I was making A LOT of these, I would probably use my cutting machine. I actually enjoyed cutting them by hand...it was a great activity to do while watching late night TV. Sooo...get out a good pair of scissors and start cutting! Once all pieces have been cut, simply peel off the freezer paper (you can reuse these pieces several times before they will not stick anymore). Stack the pattern pieces in ascending order (biggest to smallest), being sure to rotate and stagger each piece to give a more "life like" look. Take to your sewing machine and carefully align the stack under the needle. Sew a few tack stitches right in the center. Remove, and clip the threads. NOTE: If you do not have a sewing machine, you can use a needle and thread and stitch them together by hand. Lift and separate each layer, spraying with spray starch until saturated. Scrunch into a bowl shape in your hand, giving it some life! Let dry overnight until starch has stiffened. Attach each succulent to your project by tacking down with the sewing machine, using a needle and thread and sewing it by hand, or use hot glue for a quick and easy finish! We paired the succulents with our Peace In Christ printable cut with Heat Transfer Vinyl. The cutting file can be purchased in the shop, and a tutorial can be found here. 5. ROTATE THE 2ND LARGEST PIECE TO AN ANGLE AND PLACE IT ON THE BIGGEST. CONTINUE THIS PROCESS UNTIL ALL 6 PIECES ARE PLACED. Enjoy making and sharing these fun succulents!